Hill stations in Idukki add up to a big list. Munnar is the leading hill station, familiar to almost everyone visiting Kerala. The other well known hill stations are Devikulam and Peerumedu. Locations such as Lockhart Gap, Top station and Anamudi are picnic spots around Munnar. Ramakkalmedu, Kolukkumalai, Nadukani and Kodiyathur Mala are remote destinations not known to many tourists. Nevertheless, they are stunning surprises. 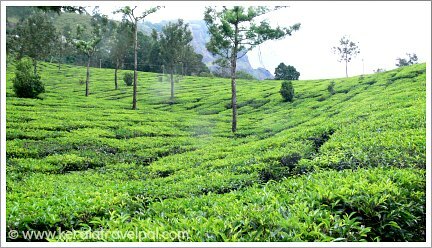 Rated as one the best hill stations in India, Munnar is a tea plantation town surrounded by circular hills replete with well cut tea plants. This highland of ever wandering mist has year round pleasant climate except for a brief period of heavy rain. Settling well for a few days is easy, as Munnar has wide choice of resorts, hotels and home stays. 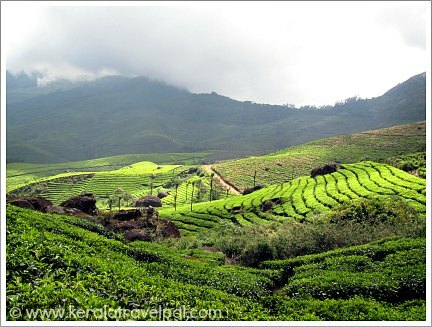 Evergreen Munnar stands 1600 m above sea level, as a symbol of chill out holidays. Whether you are on honeymooning or holidaying with family, there is plenty to see. Munnar is a gateway town from where you can travel to waterfalls, wildlife parks and spice gardens scattered all over Idukki. Altitude and scenery are the attractions of Top Station, a day tour location along Kerala – Tamil Nadu border. The height is about 1700 m above sea level. Tour operators usually include Top station in their Munnar travel packages. It is easy to extend Mattuppetty – Kundala dam visit to include Top station, just need to add an extra 10 kms scenic drive, one way. It is located along the way to Top Station, past Mattuppetty and Kundala dams. Tourists stop by to enjoy the scenery and to experiment with own echoes. The rocky clefts do reverberate sound. From Munnar, take Pallivasal road to reach Potheamedu (Pothamedu). No need for a long journey since Pothamedu is just in the outskirts. Pothamedu, a scenic lookout for top class tea garden views, is also good for nature walks. Continue along the road for another km or so to reach Pallivasal, another beautiful place with an added attraction of a hydro electric project. Tourists are allowed inside the project, during working hours. 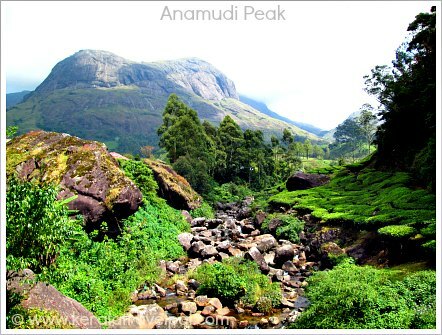 Anamudi is the highest mountain in South India. The 2965 m peak is a hot spot for mountaineering. Anamudi is part of Eravikulam National Park. So permission from forest officials is required to reach there. Eravikulam Park is a popular wildlife destination. It is the protective sphere of Nilgiri Thar, a mountain goat. The winding mountain road runs through Rajamala, another mountain which also falls within Eravikulam sanctuary bounds. The slopes of Rajamala too are home to Nilgiri Tahr. Nilakurinji (Strobilanthus) is a plant that flowers once in 12 years. This rare plant is found only in this part of the world. Nayamakad waterfall is at a convenient distance (Anamudi – 4 kms, Rajamala – 4 kms). Access may be restricted during monsoons. Another tea garden town highly regarded for stunning vista of heights and slopes. Sita Devi Lake is mentioned ancient legends. Exotic and invigorating, Devikulam is an uncrowded hideout up the hills, if you are looking for one. There are a few resorts for overnight stay. From Devikulam, travel 10 kms south west (Kochi - Dhanushkodi Road) to reach this vantage point, ideal for brief picnics and strolls. The tea gardens of Kolukkumalai produce some of the most flavoursome tea. have you heard that increase in altitude is a positive for the quality of tea? At about 7100 ft above the sea level, Kolukkumalai is the highest organic tea estate in the world. No need to add anything about the quality of tea produced here, right? The location is fantastic and the views are awesome. Kulukkumalai is past Devikulam and Lockhart Gap. Continue through the same road (Kochi - Dhanushkodi Rd / Munnar – Kumily Hwy) and turn left to Sooryanelli Rd. Only jeeps or SUVs can travel through the mountain path and the ride is going to be really bumpy. Ramakkalmedu is an outstanding location of excellent panoramic views. From the top, the plain far below appears as a carpet of red and green rectangular patches, rimmed by mountains. The wandering wind is an everlasting presence, strong enough that the government has set up a wind farm. Kuravan and Kurathi statues, artistic work inspired by local legends, look monumental atop of the hill. Ramakkalmedu is a day tour destination for tourists except for a handful who chose to stay at one of the few resorts here. One of the finest hill stations in Idukki, Peerumedu (Peermade) is an invigorating mix of hills, brooks, waterfalls, forests, meadows, tea gardens and other plantations. The air is fresh and cool and the mist is persistent at 1000 m above the sea level. A summer palace of Travancore Kings is now a converted Guest House, taking tourists in for overnight stays. There are a few resorts as well. If you are fond of adventure activities, travel 9 kms east to Kuttikkanam, to join similar minded folk for trekking, paragliding, horse riding or the like. Want to see sun rises and sun sets at their best? Thrishanku hill, 4 kms from Peermede, is the place to be. The high held hilltop is named Eagle Rock (Parunthupara) for obvious reasons. The terrain is an extension of Peerumedu, so expect similar sights. Vandanmedu is a spice town. The main local produce is cardamom, which is highly regarded for its quality. World’s largest cardamom auction happens in this tiny town! Vandanmedu located at Southern Idukki, is an answer to spice garden holidays. The main tourist attraction in this region is Thekkady Wildlife Sanctuary, roughly 22 kms to the south. A place of spiritual significance, Calvary Mount draws devotees. The scenic view from the top deserves an all stars rating, so tourism trail and pilgrim path have become one and the same. Calvary Mount is about one shot visit and not for overnight stay. Nadukani near Idukki border is a country side among the hills. The height is roughly 3000 ft above sea level from where you can see regional landmarks. Nadukani is at the outskirts of Idukki Wildlife Sanctuary. This reserve is rich in animals, and for many travellers it is a quieter alternative to crowded Periyar Reserve. Another refreshing sightseeing spot is Kulamavu Dam, 8 kms from Nadukani. Nadukani remains a day time picnic spot for the lack of tourist accommodation. There is Green Berg resort. You will have to look in the wider area to find the right place to settle in. 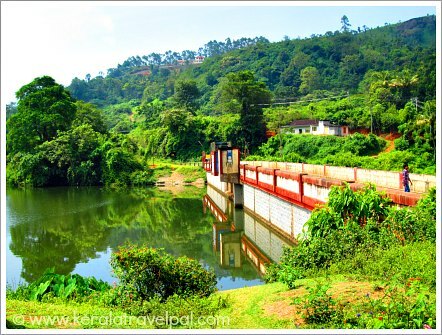 This stunning location of hills and a lake is not known even within the bounds of Kerala. Malankara dam, Moolamattom Hydel Power Station and Ilaveezha poonchira are tourist attractions within 10 kms. As this is an upcoming tourism spot, you may have to look regionally (Thodupuzha or other towns) for overnight stay.